D.PEd) is for Inter Pass Students. ➤The candidates have to attend 400 marks physical efficiency test ,100 marks skill test. ➤The candidate must have through knowledge of any one of the game mentioned below to score skill test marks. ➤He or she must be physically fit for physical test. It is mandatory to attend for all candidates. Osmania University, Hyderabad has issued a notification to conduct Telangana State Physical Education Common Entrance Test 2017 for those candidates who are seeking for admission into B.P.Ed and U.G.D.P.Ed, which are two-year full time course. Every year a great number of candidates appear in this entrance test. This is an annual entrance test govern by Telangana State Council for Higher Education. Application form for TS PECET 2017 are invited via online mode. The candidates who are eligible may submit their application form for the same from the official website. ➤He or she must be an India National and a domicile of Telengana State. 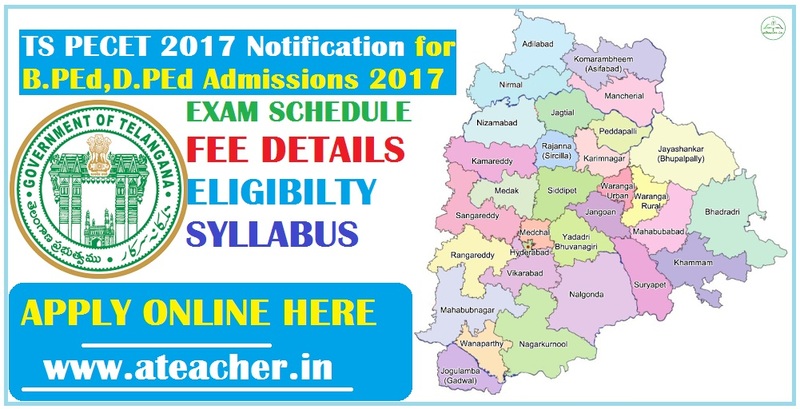 ➤The candidates preferring B.P.Ed (Two Years) course must have passed or appearing final year for under graduation is eligible to write Telangana PECET 2017. ➤The candidates preferring U.G.D.P.Ed (Two Years) course must have passed or appearing intermediate exam recognized by state or central educational board. ➤A candidate who is a native of Telengana State and studied in other state is also eligible. ➤A candidate with higher educational qualification is also eligible however, he or she must come under the prescribed age limit. ➤He or she can pay the fee online while registering for TSPECET 2017. ➤Enter all fields carefully and re-check once before submitting. ➤All candidates who, successful completed registration via online will receive the registration number and SMS alert. ➤The registration ID number is unique one and you have to use until the selection process is over as reference. ➤The registration fee for reserved (SC & ST) candidates is INR 350. ➤The registration fee along with late fee is applicable until May 2017. ➤The late fee starts from INR 500 to INR 5000 as per the late fee date notification. ➤You can make online payment through net banking and by credit card. ➤You can pay at e-seva and TS online. You have to mention the payment receipt number while registering online. ➤The registration fee once paid is non-refundable and non-transferable. The candidate preferring B.P.Ed must attain 19 years of age as on 1st July 2017 for the academic year 2017-2019. The candidate preferring U.G.D.P.Ed must attain 16 years of age as on 1st July 2017 for the academic year 2017-2019. ➤To write skill test, he or she must have the knowledge of any one of the game as mentioned below. ➤A candidate has to choose one game while registering for Telangana PECET 2017. ➤The skill test comprises of 100 marks. ➤A candidate has to take part in 100 meters run, which carries 100 marks. ➤A candidate has to take part in 800 meters run, which carries 100 marks. ➤A candidate has to take part in 6 Kg Slots putting, which carries 100 marks. ➤There is long jump and high jump, which carries 100 marks. ➤A candidate has to take part in 400 meters run, which carries 100 marks. ➤A candidate has to take part in 4 Kg Slots putting, which carries 100 marks. How to Download Hall Ticket for TS PECET 2017? You have to log in with your user ID and enter your application number and date of birth to generate admit-card and take a print out of it. What is Counseling Process of TS PECET 2017? The counseling part is very important to all those candidates who have scored good ranking in the entire test. The original document verification is mandatory while going for counseling.